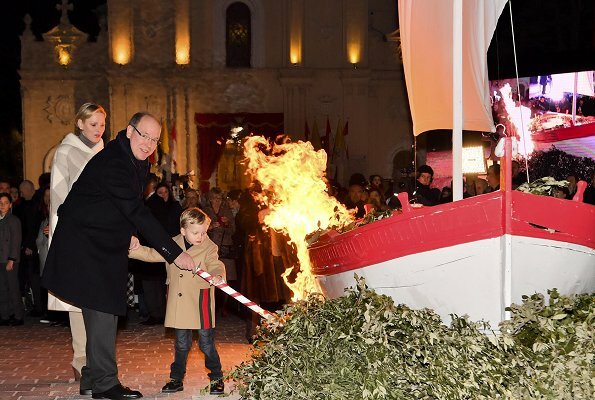 On January 26, 2019, Prince Albert II, Princess Charlene and Crown Prince Jacques of Monaco attended symbolic boat burning event held as part of Saint Devota celebrations. 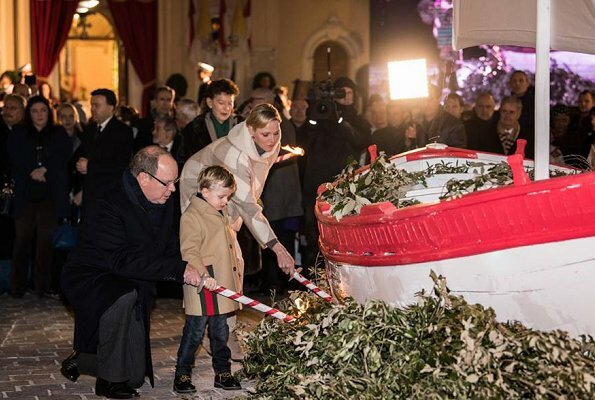 Saint Devota celebrations take place on January 26-27 every year and people of Monaco get together to celebrate Saint Devota and burn a boat symbolically. 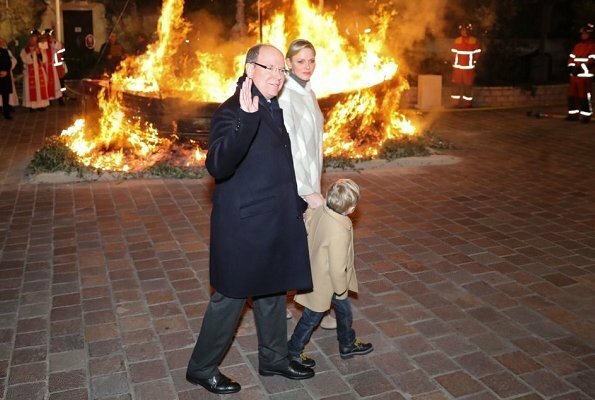 After the boat is burned, a fireworks show is performed at Hercule Harbour in Monaco. 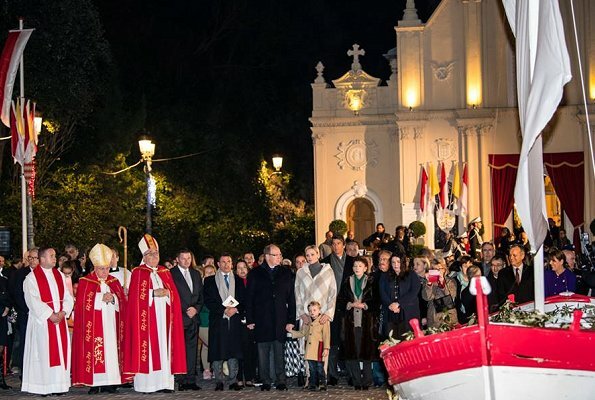 Saint Devote is the patron saint of the Grimaldi family, reigning in Monaco, and is celebrated each year as a national holiday. Very nice appearance by the three of them. 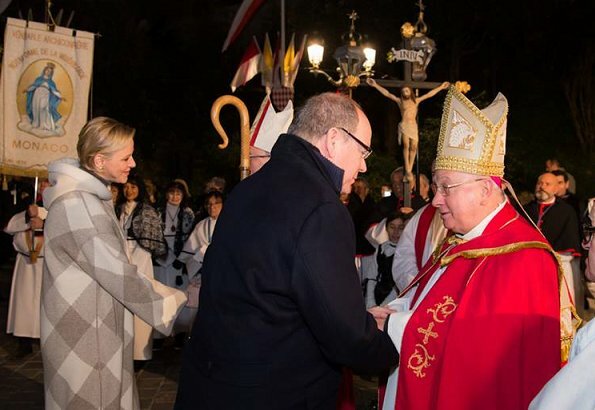 I like these kinds of traditional customs - I'm glad they are being kept going in some parts of the world. 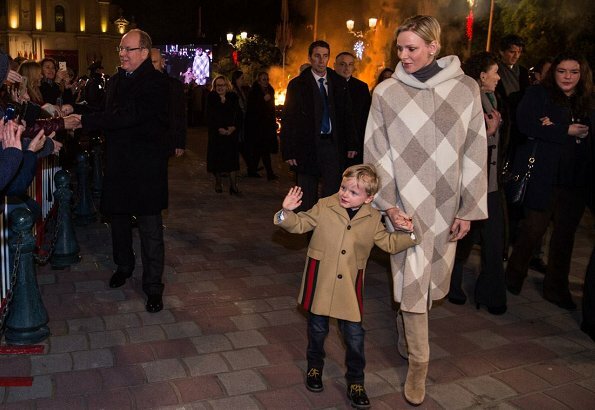 I just love Charlene's coat here - it looks so cosy and warm but she looks stylish at the same time. Nice light neutral make up is very flattering. She seems to have dialled back on the lip fillers which I prefer - she looks very natural and beautiful here. Jacques is cute and seemed very confident when greeting the crowd but quite tired beforehand. Not sure about the obvious Gucci branding on his coat although the coat itself is smart, glad he is wearing proper shoes and not trainers. 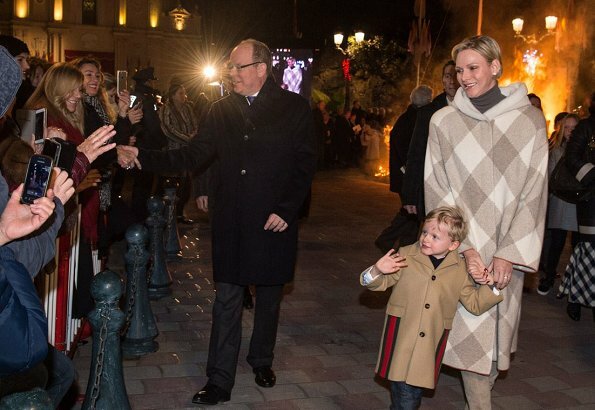 Shame Gabriella wasn't there but still a lovely appearance of the family. I wonder why Gabriella wasn't there? 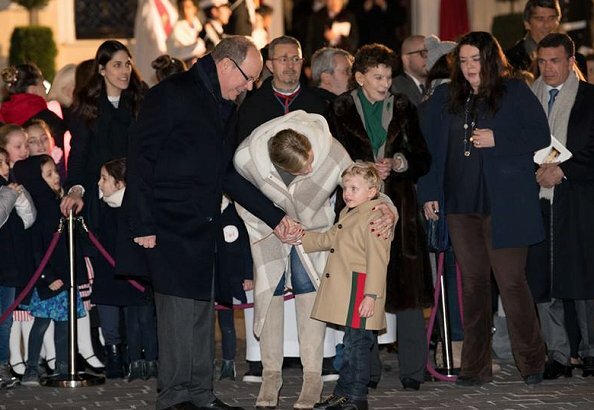 I really hope that it isn't going to be one of those outdated royal family traditions, where the boy is favored more because he's the oldest and the heir. More likely that she was ill or tired I would have thought - they both usually attend these sorts of events together. Actually Gabriella is the older of the two. 2 toddlers under the age of 5, I'm inclined to think she has a cold or the sniffles. Actually, she was born first. 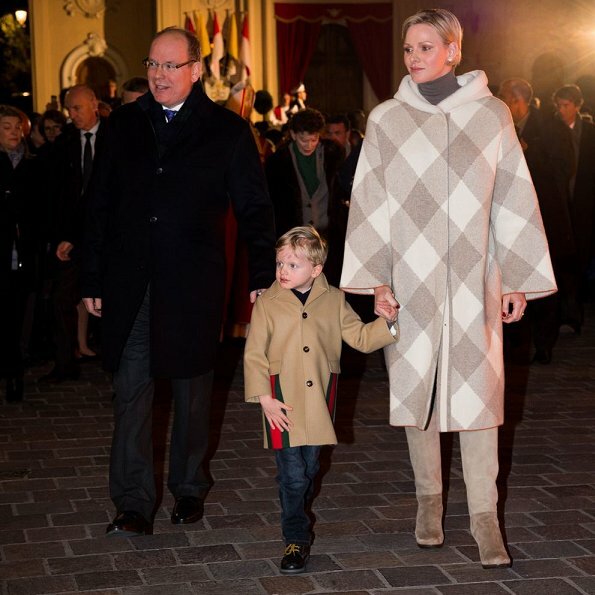 About Jacques coat, he's a young boy so he could see it as racing stripes or military stripes and think its cool. Charlene's outfit is nice, too. 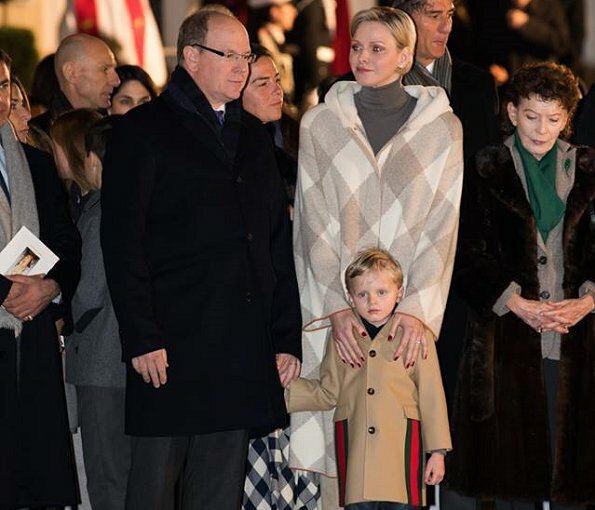 Je pense que Gabriella est peu être malade d où son absence. J ai suivi la célébration à la télévision. 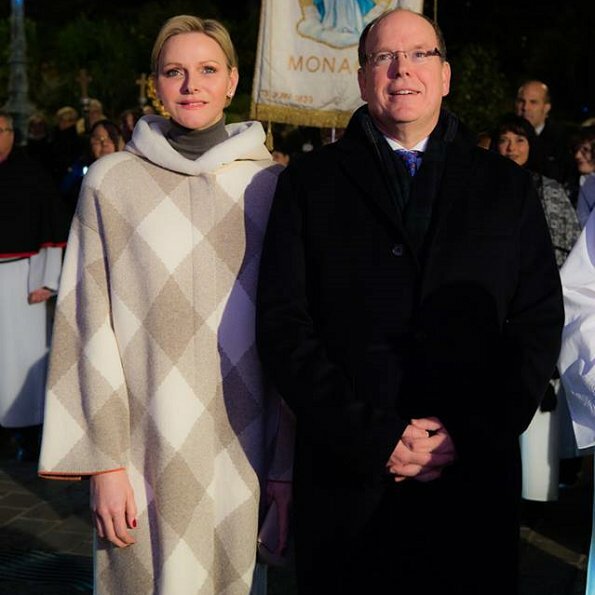 Un beau couple,respectant la tradition. J aime beaucoup la tenue vestimentaire de Charlene . Charlene looks better than she has in a long while. she is wearing bright neutral colors. i suppose Gabriella was not feeling well this time. ik wil wel die mooie jas hebben. 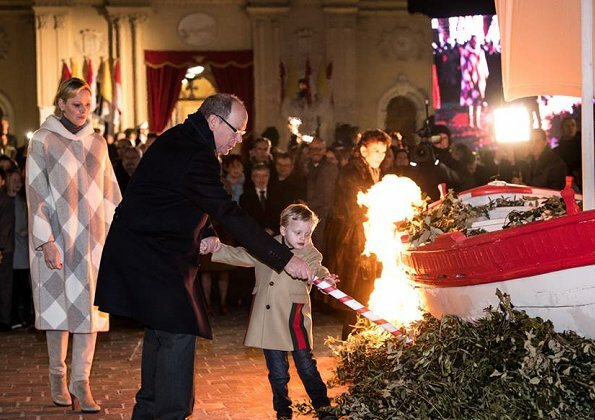 J’aime beaucoup le prince Albert mais alors Charlene est très énigmatique je l’aime pas !!!!! Groß ist er geworden , der süsse Jacques !! een prachtige jas ,en staat haar prachtig, het is een heel leuk gezinnetje !! !